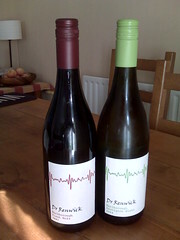 I was walking past Oddbins and the sign outside had a special offer on "Dr Renwick" wine. Well of course I had to go in and buy a couple! "In 1856 Dr Thomas Renwick gave his name to the small settlement of Renwick town that is now the heart of Marlborough's wine growing region. Our family vineyards, once part of the Doctor's pastoral land holdings, have responded well to our bio-friendly vineyard practices. The resulting wines display a richness of flavour with great character and depth... we are sure the good Doctor, a wine enthusiast himself, would have approved."